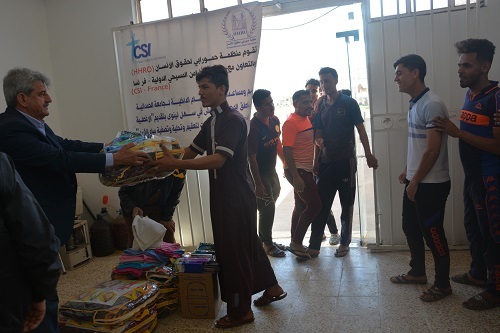 Hammurabi Human Rights Organization provides students of internal department (125) blankets, towels of the same number, sanitary sterilizers, toothpastes, shavers, brushes and shaving machines for all students. 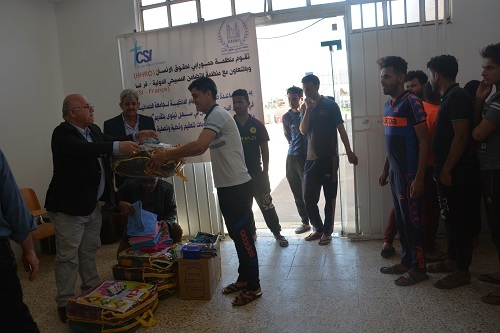 The organization presents the students four modern water purification and desalination systems. 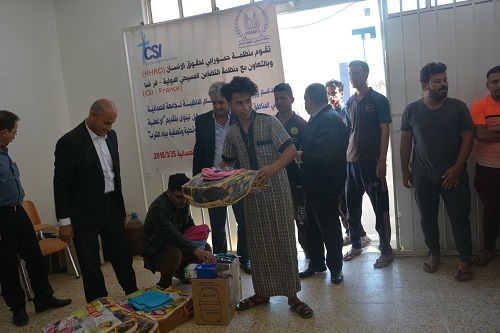 A relief team of the Hammurabi Human Rights Organization HHRO visited the University of Al-Hamdaniya at Al-Hamdaniya district in Ninewah province on March 25, 2018 carrying a variety of relief items including 125 blankets, towels of the same number, water purification and desalination systems , sanitary sterilizers, toothpastes, brushes, tissues and other home supplies to be distributed to 125 student of the university internal department. 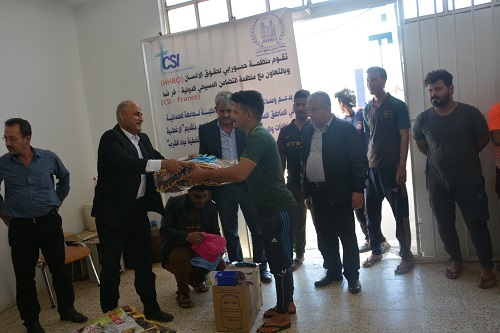 The relief team was received by Dr. Anes Bahnam Vice President of Administrative Affairs, Dr. Riath Mubarak Dean of the Faculty of Education, Ali Hussain Director of the University's internal department, and a group of students. 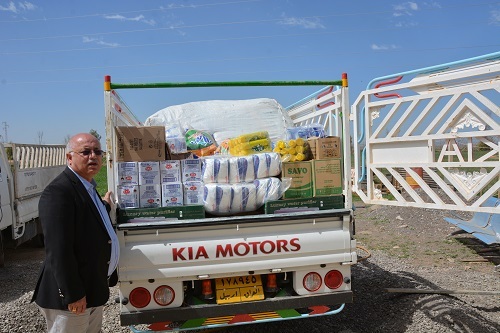 The relief team of Hammurabi Human Rights Organization included Mr. Louis Marqus Ayoub Director General of the Organization in Erbil, Eng. Amir Saeed Mal Allah, Eng. Faris Jarjis Yacoub and Farhan Yousef members of the General Assembly, and Adel Saad, Media Advisor of the organization. 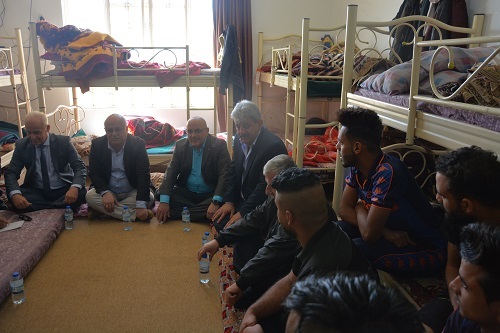 At the beginning of the visit, a meeting was held in which a delegation of Hammurabi organization visited one of the rooms of the internal department. Mr. Louis Marqus Ayoub make an introductory speech between the students and Hammurabi Human Rights organization being a civil society organization which, since its establishment in 2005, has been a field organization. 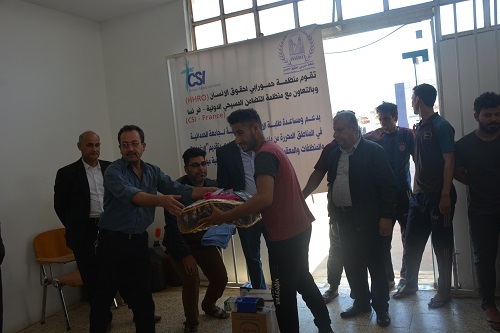 Volunteer work is committed to serve Iraqi citizens away from bias towards the Iraqi components, while Mr. William Warda focused on the priorities of the organization, the human rights aspects in monitoring violations ,documenting and issuing periodic and annual reports thereon and follow up with the concerned authorities to find support for these rights based on the fact that Iraqis are equal regardless of their affiliations, religious and ethnic, and we in the organization aspire that a citizen to be an observer and defender of rights, especially the young people. 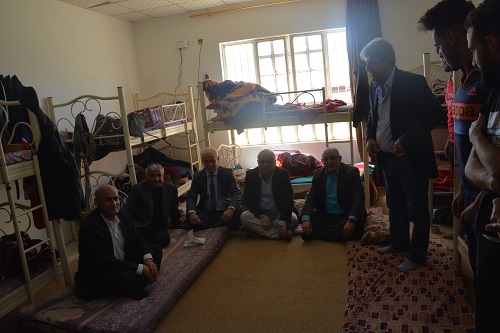 On his part, Dr. Anes Bahnam expressed his appreciation and thanks to the delegation for the initiative of relief and looked forward to further cooperation to meet the rights of students and provide the scientific climate for further study. In his speech, Dr. Riath Mubarak stressed on the psychological criteria and the basic needs of students as the necessary framework for study. Mr. Ali Hussein also referred to the needs of the internal department and the correlation to allocate adequate budget allocation. Finally all reach to a conclusion of the importance of communication among Iraqi's representing a successful path to their unity, security and development aspirations. Some students presented poems in an atmosphere of satisfaction and joy.